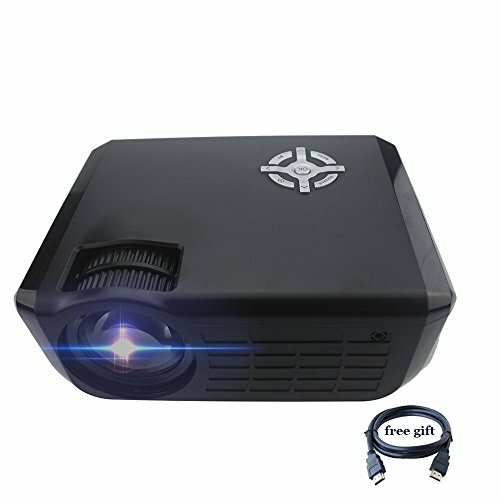 720P Video Projector takes you the fire new & unprecedented experience,Enjoy watching newest movies and playing favorite games on 40-150 inches big screen instead of watching on previous devices with small screens,which can help you and your family enjoy large screen while protecting your eyes. What's more, True to life picture and more vivid colour is really a visual enjoyment and a great improvement compared to others. 1.NO recommended for excel,PPT,word or business presentation. 3.The USB port only support USB flash drive, NOT support cord connection and data transfer. 4.A HDMI ADAPTER (You need to order it separately) is required if you connect the projector to tablets and smartphones. 【Long Lasting Lamp Lives】lamp life lasts over 50000 hours,even if you watch a two-hour movie every day.This projector's lamp should last many years,what's more,you can get rid of getting a replacement lamp. 【Super cost-effective projector】The newest Portable home theater Projector.Similar DLP Projector exterior design and DLP hidden telescopic manul lens.Let you watch the effect of DLP projector with lower price.